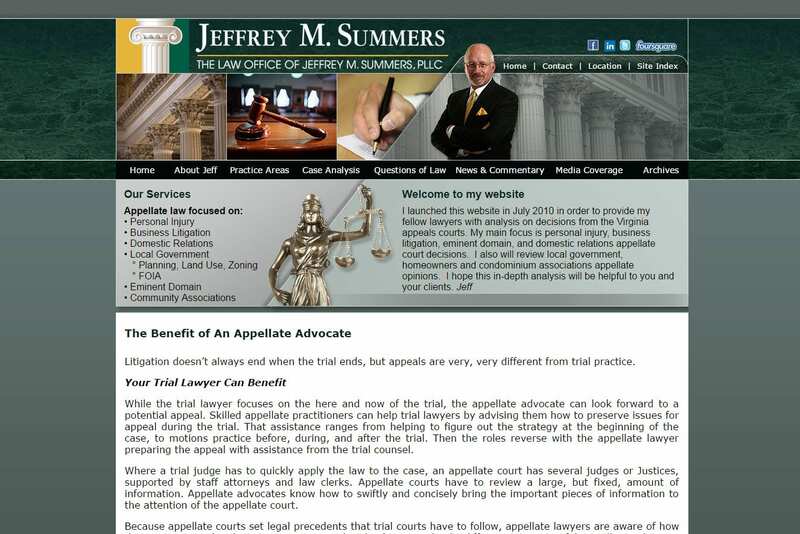 Website design for law practice Richmond VA | This attorney website generates online leads and supports existing clientele. The website was developed in Classic ASP for Windows hosting server. The website has rich colors and a complete custom design developed in Photo Shop. Jeffery M. Summers PLLC Law has offices located in Richmond, VA. When searching Website Design Richmond VA look no further than the web design experts at VISIONEFX. VISIONEFX, a Web design company based in Virginia Beach, VA provides extraordinary web design for small and large businesses throughout the United States to include; custom web design, web development, E-commerce web design, Word Press web design, Word Press plugin customization, Joomla web development, SEO – search engine optimization, web maintenance services, custom database and programming for custom web applications. Call: (757) 619-6456 or email info@visionefx.net.